Preheat the oven to 450°. In a large roasting pan, melt the butter in 1 tablespoon of the oil in the oven; swirl to combine. Add the cauliflower, stems up, and season with salt and pepper. Cover with foil and bake on the bottom shelf of the oven for 30 minutes. Increase the oven temperature to 500° and bake for 10 minutes. Remove the foil and continue to bake for 10 minutes longer, or until the cauliflower starts to caramelize on the bottom. Meanwhile, in a large skillet, heat the remaining 3 tablespoons of oil. Add the onions, cover and cook over low heat, stirring occasionally, until very tender, about 20 minutes. Stir in the curry powder and mustard seeds and cook, stirring, until fragrant, about 5 minutes. Add the lemon juice and season the onions with salt and pepper. 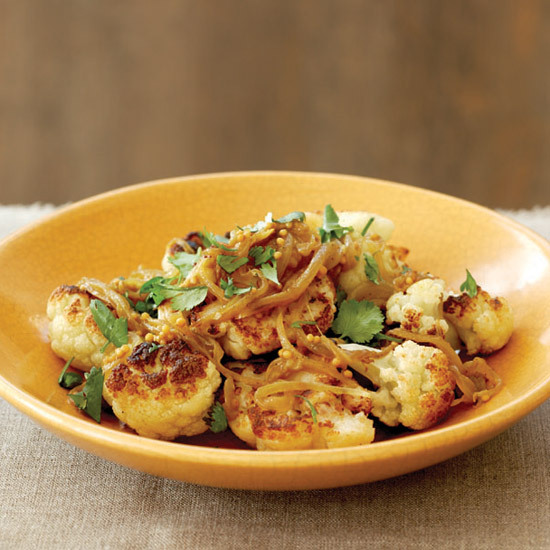 Transfer the roasted cauliflower to a large serving bowl and spoon the onions on top. Sprinkle with the chopped cilantro and serve at once.